Rose-purple flowers along the upper end of arching stems up to 2′ tall from June – September. 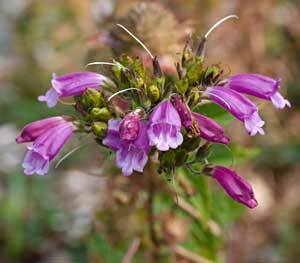 The blossom is similar to a penstemon, but the upper lip is shorter than the lower. 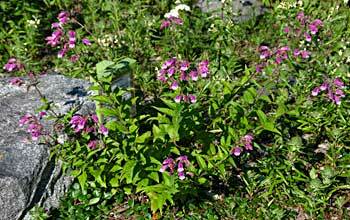 Leaves are lanceolate and serrated, up to 4″ long. Found in woods and moist rocky slopes at low to high elevations. Full sun to part shade and moist to rather dry well drained soil. Native from southern BC to NW California.